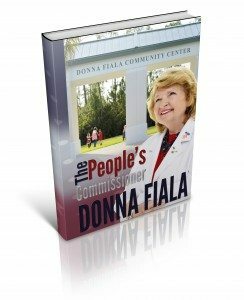 Sunshine Ace Hardware will host community champion and contributing author of “The People’s Commissioner,” Board of County Commissioners, District 1 Commissioner Donna Fiala, for an intimate book signing and old fashioned cookout from 11 a.m. – 1 p.m. on Saturday, May 6, at Sunshine Ace Hardware, 4433 Tamiami Trail, East Naples, FL 34112. Members of the community are invited to meet Commissioner Donna Fiala, and enjoy a neighborhood cookout. All proceeds from the sale of the book will benefit Kiwanis East Naples, a local 501(c)3 nonprofit organization established to benefit underprivileged children in the East Naples area. More specifically, funds raised throughout the event will help provide local children with improved recreational facilities, updated educational resources and increased access to scholarship programs. “The People’s Commissioner: Donna Fiala” is a collection of vignettes documenting Commissioner Fiala’s effect on East Naples and Marco Island. It’s described as a fun, fast read that explores her journey serving more than four terms for Collier County. “We are proud to host a community event providing residents with a chance to meet Commissioner Fiala in a friendly neighborhood setting,” said Michael Wynn, President, Sunshine Ace Hardware. “We’re also very happy to support such an occasion that will benefit many wonderful programs serving local children in the East Naples area,” he said. For more information, call 239-775-2150. Commissioner Donna Fiala is a well-known, humble and giving politician who embodies a servant heart. On retiring from corporate life in 2000, she ran for Board of County Commissioners, District 1 Commissioner, and has held that position ever since. As such, Commissioner Fiala is the only commissioner in recent history to serve Collier County for more than four terms. To honor all she has achieved throughout her service, in 2015 Collier County unveiled the new Donna Fiala Community Center at Eagle Lakes Community Park in East Naples. Ever a champion for the healthy activities of her constituents, Commissioner Fiala is now working to expand those facilities to include a swimming pool complex. The East Naples Kiwanis Foundation is a 501(c)3 qualified nonprofit organization. 100% of donations received are used 100% toward children’s programs benefitting underprivileged children in the East Naples area. Today Kiwanis clubs in local communities around the world continue to increase their services to children. By building parks, stocking school libraries, providing scholarships and recognizing elementary students through the Kiwanis Terrific Kids and Bring Up Grades programs, Kiwanis clubs are directly contributing to thousands of success stories every day.